A Philadelphia nonprofit is trying to give immigrant kids a creative outlet for anxiety about deportation. The workshop room at El Futuro, an outpost of the nonprofit Mighty Writers. 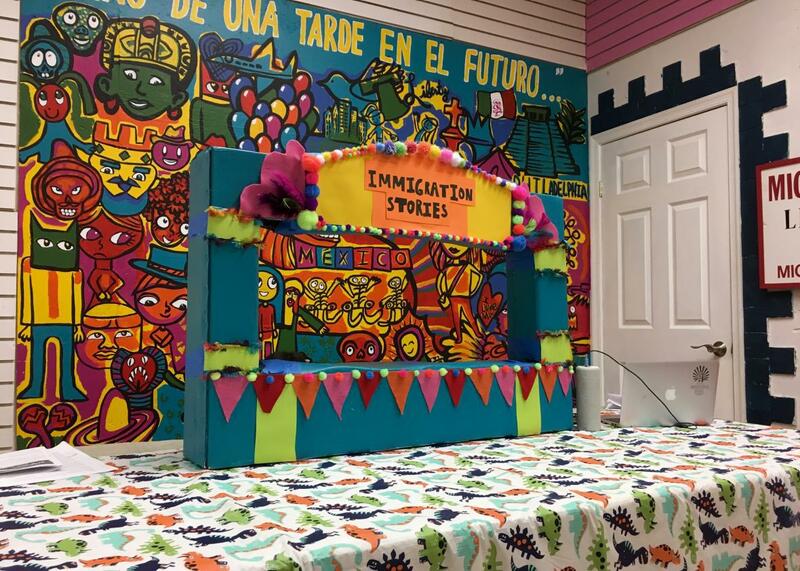 For the past six weeks, Sanzetenea has led a puppet-making workshop at El Futuro, an outpost of the nonprofit Mighty Writers, in which a dozen elementary schoolers wrote monologues about their own immigration experiences and built puppet alter-egos to perform them. The idea was hatched in the run-up to the 2016 election, as Trump’s anti-immigrant rhetoric intensified and the organizers of Mighty Writers detected a growing sense of nervousness and fear among the young students they work with, many of who come from families with undocumented parents. “I was so surprised to hear how genuinely scared these kids were on a daily basis of coming home to find that their parents or family members had been taken,” Sanzetenea said. “They had such elaborate plans that had been so clearly discussed about what to do in those scenarios. Every single time they opened the door there were strategic measures.” Tim Whitaker, who founded Mighty Writers in 2009, explained that they wanted to find a way to relieve the students’ anxiety. “These kids walk around with a cloud over their head about possible deportation,” he said. Many of the children understand with surprising clarity the precariousness of their situation. They know they have access to a certain level of safety from which their parents are excluded. And yet, there are few opportunities, especially outside the home, to commiserate, express frustration, or even joke with other kids who face similar challenges. From an early age, most are taught that being undocumented, or having an undocumented family member, is a secret to keep closely guarded. Simply to have a creative venue to talk about it –in ways unexpectedly humorous and serious, in turn–can spell big relief. The programming at El Futuro is geared mainly toward the neighborhood’s large Mexican community—like a trading floor, the space has multiple clocks on the wall, one set to the time in Philadelphia, the other, Mexico City. For the first workshop, conceived by Mexican artist Nora Litz and held early in the summer, each student made a comic book to convey some aspect of how it felt to be an immigrant in the United States. Despite the broad instructions, almost every one dealt with Trump, the wall, or some form of family separation. In one, stick figures lurch through space, desperately reaching toward each other. In another, a wall labeled “America” looms in the foreground, as horrified children gather around a living room window, peeking out. Another depicts an enraged Trump yelling “GET IN THE WALL!! !”, while two characters in the next frame, described as “Donald Trump’s friends,” laugh as an image of Earth floats above them, surrounded by question marks. For the puppet-making workshop, Sanzetenea and her co-teacher Isabel Díaz Alanís explicitly instructed the kids to focus less on politics and more on the quotidian aspects of the immigrant experience, from having to translate for your parents to carrying a lunchbox full of food that looks different from your peers’. They hoped to counteract the tendency, increasingly prevalent, to view immigration as a sob story, something shameful, and emphasize instead the hard work and bravery that comes along with straddling two cultural worlds. It was meant to be a respite. But in the end, the reality of our political moment was inescapable. The final puppet show was this past Tuesday, days after the white supremacist march in Charlottesville. Standing in front of a cardboard stage, painted aquamarine and adorned with neon pom-poms, Díaz Alanís began: “The events that have unfolded since white supremacists gathered in Charlottesville, Virginia last Saturday remind us once again of an obligation that might feel burdensome: speaking up. Speaking up to say I am here, my story is relevant, and I will be heard.” It was a heavy opening. The kids sat attentively, wiggling their puppets, while a few parents held up their cellphones, poised to record. One by one, the performers approached the stage, animating their puppets as they narrated their stories. Charlottesville was not mentioned again. But its violence hovered in the wings. In this context, these light-hearted monologues, which chronicled the joys and challenges of life in an immigrant family, felt almost like tiny radical acts. They were comprised of small, silly embarrassments involving a culturally confused parent or needling friend, the kinds of things any child, immigrant or not, would recognize. As Sanzetenea performed last-minute glue gun surgery on the cardboard set, a young Indonesian boy named Hilmy was readying his puppet, which had a blue body, a red belt, and a white star on his chest. “Like Captain America,” he explained. Then he zoomed off toward the stage.